This attractive pictorial colored map is from a page in the Geneva Bible, which preceded the King James version by half a century, and was the translation used by Shakespeare, the Puritans, John Knox, and Oliver Cromwell. The Geneva Bible, translated in Geneva Switzerland by Protestant scholars who fled from Queen Mary I’s England, was the first mass produced and printed Bible made available to the general public. The New Testament first appeared in 1557 and then together with the Old Testament in 1560. Some editions were marked with the back-dated year of 1599 though they appeared somewhat later following the issuance of the King James “Authorized Version.” The Anglicans of the Church of England disliked the Geneva Bible’s Calvinist and Puritan character. 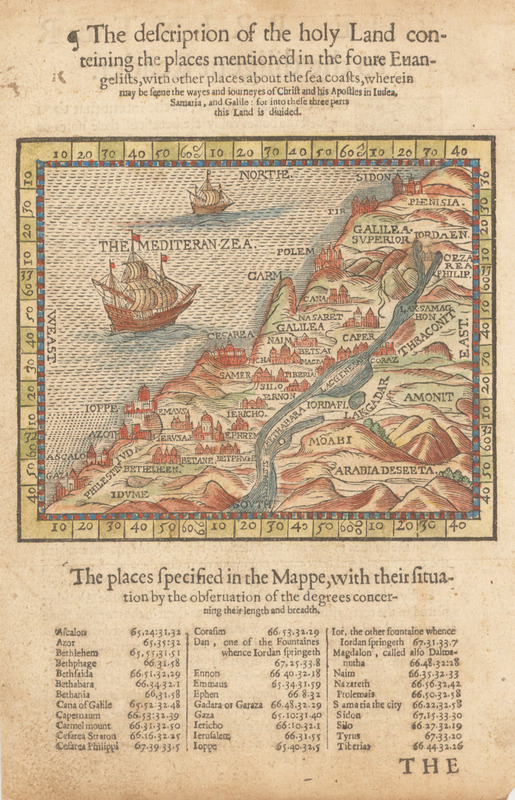 The map highlights numerous important locales, such as Nazareth, Bethlehem, Jerusalem, Sea of Galilee. The Jordan River and mountains of Judea are pictorially rendered. It is embellished with two ships sailing in the Mediterranean. A key, below the map, identifies 32 Biblical locations with their coordinates. Condition: Good condition with toning and some darkening of the lower edge.